“Upon one side of the space wherein they stood rose a lichgate, and springing from it extended an ancient Church House—partly used as dwellings for the needy and partly as a school. Before it ran a heavy porch on granite pillars above cobblestone pavement ; beside it lay Widecombe’s treasure, a fragment of the village stocks. In the midst of the central square a yew-tree stood, perched on a triple row of granite steps, while westerly appeared the smithy behind a formidable frieze of ploughs and harrows, and the Old Inn,’ a comfortable and ancient house, whose entrance was sunk beneath the level of the road. ” – Eden Phillpotts, Widecombe fair, 1913, p.7. “We stepped from the train at Ashburton on a drizzly morning, prepared for the showers. But the patches of blue sky and the advice of the communicative landlord at the Railway Hotel decided us to leave our overcoats and bags in his care, and travel as light as possible. In consultation with mine host, we discovered that we had stumbled upon the right man to give us information, as he had for some years been the Widecombe postman. By aid of a map and his knowledge we soon had a skeleton route to work by, and started sound in ‘wind and limb’ to breast the apparently never-ending hill leading from the town to the verge of the Moor. We took the road by Buckland, which passes for the most part through dense woods; the trees overhanging on each side rendered the still damp air most oppressive. The Buckland village is a gem of sylvan scenery in itself, and consists of a farm house and school, then a few romantic thatched cottages, the roofs green with moss, or gay with flowering stonecrop and lichens; they are situate on each bank of one of the prettiest little stream imaginable, and overshadowed by tall old trees also covered with moos and polypody ferns. On an eminence a short distance off is the squire’s mansion and the church. The little church we found worth visiting; it is small indeed and in sad repair, but boasts a carved screen of some interest. The upper part is open and filled with perpendicular tracery; below are twenty compartments containing figures of saints, which are mostly hidden, however, by pews. On the inner side are six compartments, on which are depicted some grotesque figures in black and white. A fine circular Norman font stands in the western end of the aisle. Leaving the church, the road commands a fine view of the wooded valley of the Webburn, with Leusdon church and some houses perched on the hill opposite. Passing the little mill and blacksmith’s shop in the valley, (Cockingford Mill) we took a footpath across some fields on the right and soon struck the road which leads up Widecombe Vale. We were now well in the celebrated valley, having barren moor or huge piles of rocks on either side, stretching far above the cultivated fields. 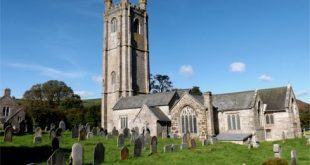 The imposing pinnacle tower of the church, a half-mile before us, served as a landmark to the village, or, as it is called Widecombe Town. Having arrived at the village we first walk round the church, which is situated on a knoll in this valley, at that point narrower than it is either immediately above or below. Clustering around the edifice are a few cottages, some quaint almshouses, a comfortable vicarage commanding a charming view down the valley, and a wayside inn. As advised at Ashburton, we called at the inn, requesting the obliging host to show us the book on Widecombe published by Mr. R. Dymond, who owns and adjoining manor, and has become the local antiquary. Book in hand we crossed to examine the church, which is, perhaps, the best specimen of the very fine Moorland churches found around Dartmoor, and on account of its size and beauty, and importance of its tower, is called “The cathedral of the Moor.” Mr. Hine in his description, remarks that for beauty the proportion of this tower has been compared to Magdalen tower, Oxford, and for sharpness and finish of detail it probably may rank first among the granite towers of the West. It is in three stages, and from the plinth to the parapet is exceedingly bold and effective in style. It terminates at the top with a fine battlement, and large and handsome octagonal pinnacles, five feet in diameter, each crocketed and surmounted with a cross. Entering the church, we found to our delight, that recent restoration had been carried out consistently with the bold simplicity of the building, but with no luxury of ornament. The bosses in the roof are curious, and show some bits of good carvings of flowers, fruit, and Christian symbols. On one is a singular combination of three rabbits, each with a single ear, which join in the centre, forming a triangle. A quaint mural tablet, to the memory of Mary, wife of john Elford, of Shipstor (Sheepstor), is worth examination. It contains an anagram, the letters Mary Elford forming the words ‘Fear my Lord’; also a chronogram, for by taking the larger capitals in the Latin sentence at the foot and adding them together as Roman numerals, we find her age – 25. The remaining large capitals will add up to 1642, the date of her death. In the tower entrance against the wall we found a description of the thunderstorm which struck the church during Divine service; it is in quaint verse, painted on wooden tablets, and said to be the production of the village schoolmaster. Of course we were pressed the ascend the tower from which a magnificent view is obtained of the valley and its surrounding hills. The ruined banks whereof remain unto this very day. And at their pleasure drew it up to keep the household safe. This house did anciently belong to Raph, the son of Raph. The stream which once supplied the moat now runs by the roadside, but traces of the moat can be seen in the deep ditches by the hedgerows. In descending the tower we examined the six bells; there are inscriptions on each of them, and on one it is recorded that £15 had been gathered of the young men and maids in 1632, we presume toward its casting. Leaving the church we were ready for such lunch as Mr. Smeardon’s inn could produce without having notice of us coming, to which we did ample justice. From the village we descended the knoll, making our way to the Rugglestone, to reach which we were obliged to leave the road at a little inn, and passing through the yard and some small fields we came to the object of our search, which proved to be an enormous block of granite; its sides are respectively 22, 19, 17, and 14 feet, having the mean thickness of five feet, and is computed to weigh 110 tons. It rests on a ledge of rock broken through the middle, to all appearances, by some great convulsion of nature, since one-half fits with great exactness into the other. It is commonly reported that this rupture occurred when the rocks were rent at the Crucifixion. The huge rock is a logan-stone, and rocks, though not without some management – indeed, it is believed that it can only be moved effectually by the key of the church. The cleft under forms a strangely winding and tortuous passage. Cattle are made to pass through it on certain occasions; and much the same folklore has gathered about it that belongs to the Cornish holed stones, and pierced blocks of certain cromlechs. This is one of the stones that were venerated, despite the condemnation of such superstitious beliefs by Bishop Bartholomew, of Exeter, in the twelfth century. The ascent of the hill from the Rugglestone is over a swampy heath; in some places soft bog, out of which issued numerous rills of clear water. Here we saw many beautiful bog plants and flowers, among them some four-leaved heath. We directed our steps to a rugged group of rocks known as Top Tor, and found the ascent much steeper than we expected, the tor being about 600 ft. above the Rugglestone, and some 1,400 above the sea level. The view was magnificent; the valley of Widecombe, which we had just left, lay at our feet, a true oasis, surrounded on all sides with barren hills, over which the higher tors of Dartmoor Forest roase as grand battlements on the western horizon. 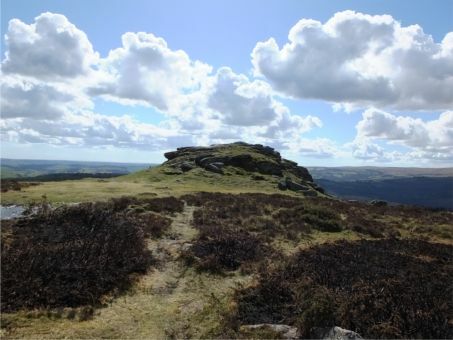 Toward the East were Haytor Rocks, Saddle tor, and Rippon Tor, with its huge cairns, and hard by the celebrated “Nutcracker rock,” another logan stone. The hillside before us was marked out and covered with ancient enclosures and groups of hut circles, which testify to the industry of a former generation, but for what purpose, and why such an amount of labour was expended must be left for the learned to decide, for to us there seemed no clue to account for their use or date. (This would be Foale’s Arrishes). 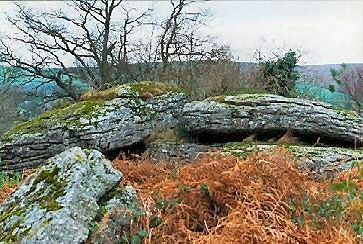 Following the ridge in a southern direction, we visited several tors and numberless enclosures, until we lighted on a perfect kistvaen, formed by four blocks of granite, let into the earth, and apparently once covered by two stones, now lying near. The depth is about 30 inches, and a person can lie in it on one side, by contracting the knee towards the breast. This, doubtless, was once a tomb, perhaps of some great and popular chief, if the stones which once formed the cairn around were each thrown on the grave by a follower. The cairn seems to have been removed to the level of the top of the centre kist, and to have been used as metal on the road which passes a few yards distant, (Seven Lord’s Land Kist). Crossing the road, we ascended a tor, a couple of hundred yards to the south. We found an enormous cairn of stones on the top, and a magnificent view of the Dart and Widecombe valley, where they unite. This tor is Wittaborough, and well worth visiting, being of easy access. Retracing or steps to the kistvaen, we followed the road into the valley, and came across a little stream just issuing from the bog, which gave it birth, (Ruddycleave Water).. Here some men were cutting peat, which serves as fuel to the moor people.. The present season has been a good one for the turf-cutters, but last year very little was saved. Following the young river down the valley, we found ourselves among a mass of debris, the relics of ancient tin streaming. Here, again, the hand of man had once been very busy, judging form the quantity of matter which had been moved, but the object was clear; tin was a valuable royal metal and the wealth of the Moor, for Risdon says, “Dartmoor is richer in its bowels than on its face.” The Stannary of Ashburton, for centuries coined a large quantity of this metal, and we were on the site of one of the “old men’s workings,” as these streamings are called. I calculate that tramp would have been about a 13 mile round trip. Clearly today it would be impossible to catch a train to Ashburton. Today the Railway Hotel is called the Silent Whistle and I doubt very much that ‘mine host’ could provide a map of this walk. Cockingford Mill no longer grinds corn and is now a farm and campsite. Very little has changed in Widecombe and due to recent archaeological work a lot more is known about North Hall. But what this author would not have seen would be the ‘Ten Commandments Stones‘ on Buckland Beacon as these were not in-situ until 1928.